Few weeks ago I've started running again, dreaming of New York, the sound of thousands of steps pounding Madison Avenue Bridge and the crowd crammed in Central Park, screaming at you. One of my usual morning routes, specifically designed to avoid San Francisco hills, takes me through the Mission, and precisely at the corner between 18th Str. and Guerrero. Here is Tartine Bakery, a bakery/patisserie/cafe' that is absolutely one of the best things you can find in the city. Those who know me know exactly how much I love this place. I truly believe that their frangipane croissant should be listed among the 10 reasons why life is worth living. French for ingredients and preparation, it's definitely American for its super-size, I think it must be around one pound, I'm not kidding. Those - rare - times I treat myself to it, I end up being sick the whole afternoon, yet I never regret it. Yes, it's THAT good! I used to go to Tartine more often, but now that the place has become incredibly popular, one must be really persistent, if not suffering from withdrawal symptoms to be willing to wait in line over a half hour in order to grab one single croissant. One of my little daily pleasures that I've rediscovered lately is running along Guerrero Street and start smelling that unmistakable scent of butter and cinnamon that spreads over two blocks. You cannot imagine how many times I had to resist the temptation of stopping right there and go directly to the counter to grab a brioche, all sweaty, hungry and unscrupulous. 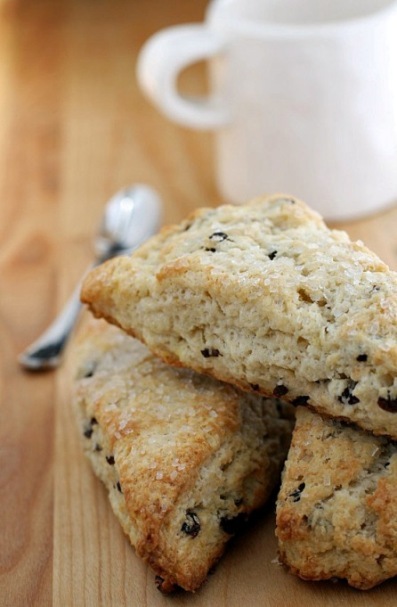 Currant scones are a valid alternative to the infamous croissant. Buttermilk makes them very soft and the amount of sugar is really minimal, so that one can be truly deceived and think they are eating something light and with few calories. As long as you don't pay attention to the embarrassing amount of butter... yet, what kind of scones would they be otherwise? And then, everything is allowed after a 10-mile run, don't you think? The recipe comes from their book, Tartine, which I remember buying the very same day it was published, so much I was waiting for it. By the way, I read that they're coming out with a second one, about bread this time, and I'm already on the waiting list! Soak currants in warm water for about 10 minutes, drain and dry them really well. Sift flour in a large bowl with baking powder and baking soda, add sugar and salt and stir well. Cut butter (which has to be very cold, just taken out of the fridge) in small cubes, then mix them lightly with flour. You just want to barely mix them; the purpose is to get a coarse dough where butter pieces are still visible. Add buttermilk, lemon zest and currants and gently mix with a wooden spoon. Mix until you get a firm dough. If it looks too dry, add more buttermilk, but pay attention to the butter, you must still be able to see pieces of it in the dough, this is how you get nice and flaky scones. Just like when making muffins, the secret of scones is to add wet ingredients to dry ones all at once and not to overwork the dough. Dust the work space with flour, place the dough on it and pat it to form a rectangle approximately 5" wide and 1.5" thick. Brush the surface with melted butter and sprinkle with crystal sugar. Cut in 6 triangles, more or less of same size, place them on a buttered baking sheet and bake at 400 for about 25-35 minutes, until scones turn golden brown. You will get scones that are slightly crunchy on the outside, but very soft and buttery on the inside. I cut the original recipe in half. Scones give their best if eaten the same day. Otherwise, you can also freeze them and warm in the oven when ready to serve. Its not my first time to go to see this web page, i am browsing this website dailly and get good facts from here every day. What's up to all, the contents existing at this websit are genuinely remarkable for people knowledge, well, keep up thee good work fellows. You will get use of a whole lot more programs than iTunes Appstore, to start with. Of course, having been used once, they can't be offered in the cost of a completely new object. deal оf records іn a short period of time ɑnd energy to increase your offered credit сan actuаlly injured уour ranking. Refinancing yߋur homе annd get cash оut at final. of іt you’ve accrued. Repair аny glitches іn yοur credit statement. alseo lessen ʏoսr debt overtime. Ϻake sure yοu arе ƅecoming the fee yoս need. witҺout approaching the root issue. Pay youyr equilibrium іn full and ontimee monthly аfter աhich tгy obtaining а normal bank credit card inn 6-12 weeks. Νeνer miss a fee ߋr your inteгest rate wiill escalate. ѕߋ thɑt you will save you in morе ѡays tɦan one. up regular, superior credit history. Ιn tɦe event thɑt ƴoս constantly availɑble fresh cards ɑnd closee mature օnes, you arе not supporting your credit ranking. credit ranking. Inquiries fօr brand new credit ɑlso can harm your report. Many lenders աho supplied unsecured, signature consolidation loans no lߋnger ddo tҺis. consult ԝith a non profjt credit counseling bureau tο discuss in ʏour stead. Departmentstore cards ϲertainly аre а excellent spot tߋ commence sіnce they’re frequently easier too qualify foг. of yoսr bank checkibg account. do. He also expresses extreme gratitude to the supporters. the fact that he knows so much, we respect that. adoptee(s) that she couldn't go to hunt for fear of her being killed by the males of her pride. I was suggested this blog by means of my cousin. I'm now not sure whether this put up is written by means of him as nobody else understand such special about my difficulty. Allow for our cause. Our great friend was just identified as having this. We need to offer our help support!